I had forgotten that I put this movie in my Netflix queue, so I was pleasantly surprised when it showed up in my mailbox. 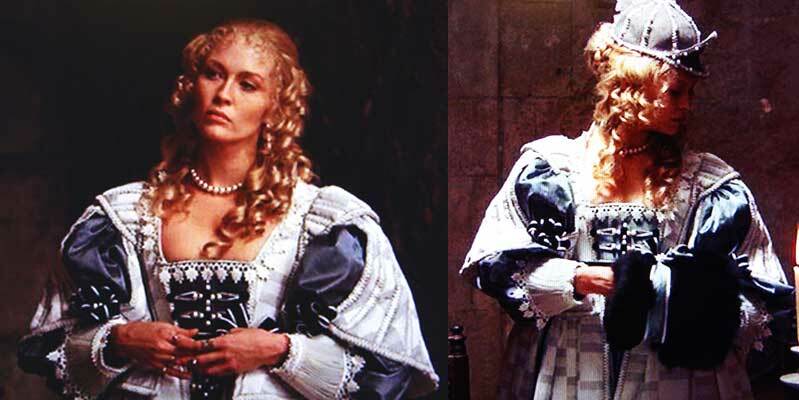 Since the movie takes place in the early to mid 17th Century, I wasn’t really anticipating finding great fashion inspiration. In terms of everyday wearability, my guess was correct- while the movie was at times amusing and at times baffling, the clothing was, on the whole, uninspiring, though it was nominated for an Oscar for best costume design. However, if you break the costumes down to bits and pieces, there are definitely some good ideas to be gleaned. 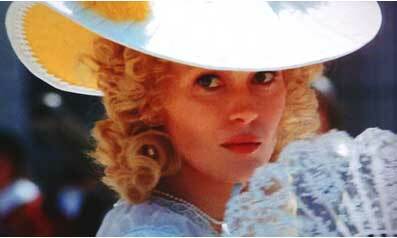 The best (and most) clothes by far were worn by Faye Dunaway as Lady deWinter. deWinter wears some supremely ridiculous headgear, which unfortunately hides some beautiful coiffures. I imagine Lady Gaga would like this hat. I, however, love the pearls in her hair. This is what she wears as she goes to assassinate an English duke/ Prime Minister. She is unfortunately caught before the deed is done, so she also wears this in the tower of London. I nominate her for the Best Dressed Prisoner this side of the Thames- I love the lace detailing and that exceptionally wide neckline. If one had a hungry swan perched upon their forehead, this is what might happen. This is her outfit for petitioning Cardinal Richelieu for the privilege of the aforementioned assassination. She more or less gets what she wants, and does it wearing the most delightful fur muff! This dress had great detailing, and the color is beautiful. I object, slightly, to the hat: from the front it looked like a little bird was stretching its beak open to receive its breakfast. From the side, you can see the little birdies tail. I do love that all of her clothes tell a story though- I wish I could do the same with my outfits every day. What one should wear for seduction. These are two of deWinter’s dressing/ night gowns- the first she wears as she’s “nursing” Dartanyan back to good health after a scuffle in the market. The second she wears after an apparent tussle in the sheets, when she decides to engage in a little post-coital homicide. Poor Dartanyan- it’s a wonder he could find what he needed beneath all those yards of drapery. Imagine what Scarlet O’Hara could have done with that… Notable details- matching mules! And unfortunately fertile armpits. Hooray for historic authenticity! I do truly love the ribbon detailing and little cap sleeves on the second gown. "I need a bath. I reek of England and Calvinism." Here’s a series of the rest of Faye’s great looks. I absolutely covet that corset. You can see on my right sidebar that I have a particular affection for corsets, as evidenced by one of my favorite books. I can guarantee that this one is not in that book- but it should be! It’s so completely impractical, but I love it. The next two images are actually from the same look- the pink is an underdress for the white. The last look is what she wears after she’s escaped from the Tower and is heading back to France, hence her snarky remark about stinky England and Calvinism. I just love that she is so delightfully frothy and feminine even while perpetrating such dastardly deeds. Despite what it may have looked like so far, there are other women in this movie- the first two shots are the French queen. Lots of detailing- and that sunburst collar could have the makings of a spectacular Halloween costume. You should also note that her second gown is in this year’s color, honeysuckle (see my Spring 2011 Fashion post). Number 3 there is Raquel Welch doing what she apparently does best- straining the strings of a well-bound bodice. Finally, that peasant there is actually wearing the most wearable outfit in the entire movie- a simple brown skirt and white peasant blouse. I wish I could do my hair in those braids- I think they’re quite lovely. When I wasn’t focusing on Faye, the gentlemen’s costumes were giving my a phobia of doilies and a sudden craving for gimp, braiding, and soutache to add to whatever my next project might be. Oh dear- there aren’t any pirates in this movie are there? We have Musketeers wearing doilies (but I love the detailing on their gloves! ); a King showing more pomp and circumstance than my high school’s marching band, and Lady deWinter’s lover facing the firing squad (also wearing a doily with his eyepatch).